October brings Fall, football, and fresh crisp weather, which, in my book, invites a large pot of chili to slowly simmer on the stove, filling the kitchen with the heady scent of browned meat, tomato, and spice on a blustery afternoon. Now, there are many versions of chili, and I am hardly a purist. Generally speaking a good chili includes meat, beans, chile peppers, onions, and tomatoes, and, in my opinion, it should be thick and packed with goodies. From there, the variations and tweaks are up to you. Not a meat eater? No problem – just double up on the beans. Want more substance? Add a hearty grain to thicken. Not too keen on heat? Tinker with the chiles, opting for more sweet than hot. This is a chili template I use when I crave a spicy, hefty stew. The common denominator is the plum tomato stock amplified with a generous amount of southwestern spice and chile heat and fortified with stout or beer. I’ll change the meat and occasionally add a grain such as barley for extra oomph. The beef chuck can be switched to pork, turkey, or chicken – or entirely omitted for a vegetarian version with an extra helping of beans. In this recipe, I added barley for texture and extra nutrients. Other grains such as farro or wheat berries can be substituted as well. 1. Heat 1 tablespoon oil in a large Dutch oven over medium-high heat. Season the meat with salt and pepper. Add to the pot in batches and brown on all sides, 6 to 8 minutes. Transfer to a plate. 2. Add 1 tablespoon oil to the same pot. Add the onion and sauté over medium heat until softened without coloring, about 3 minutes. Add the peppers and sauté until brightened in color, about 2 minutes. Add the garlic and sauté until fragrant, about 1 minute. Add the chiles in adobo, the chili powder, cumin, and paprika and cook, stirring, for 1 minute. 3. Return the beef to the pot and add the tomatoes, stout, tomato paste, bay leaves, brown sugar, and 1 teaspoon salt. Bring to a boil, then reduce the heat to medium-low. Partially cover the pot and simmer for 30 minutes, stirring occasionally. Taste for seasoning and add more sugar or salt if desired. Stir in the black beans and barley and continue to simmer for 10 more minutes. 4. Ladle the chili into serving bowls. Serve with the garnishes for sprinkling. Winter and the Superbowl demand a hefty bowl of chili, and this recipe will surely do the trick. Loaded with beef, black beans and barley, the key to this thick and rich stew is a heady tomato stock fortified with chipotles and stout beer. While you shouldn’t tinker too much with the aromatics, do feel free to adjust the meat and grains. The beef chuck can easily be switched out with turkey, chicken, or pork – or entirely omitted for a vegetarian option (just double up on the beans instead). I like to add barley to the mix – it adds great texture and extra nutrients. Other whole grains such as farro or freekah can be substituted as well. 1. Heat 1 tablespoon oil in a Dutch oven over medium-high heat. Season the meat with salt and pepper. Add to the pot in batches and brown on all sides. Transfer to a plate. 2. Add 1 tablespoon oil to the same pot. Add the onion and saute over medium heat until softened without coloring, about 3 minutes. Add the peppers and saute until brightened in color, about 2 minutes. Add the garlic and saute until fragrant, about 1 minute. Add the chiles in adobo, the chili powder, cumin, and paprika and cook, stirring, for 1 minute. This is a chili template. You can follow it and substitute your favorite meat or even make a vegetarian version by skipping the meat step. In this chili I went all in, combining bison, black beans, and barley. If you haven’t tried bison I encourage you to try it. Bison is leaner, lower in cholesterol, and more rich in protein and Omega 3’s than beef. Other proteins such as beef chuck, pork, chicken or turkey can be substituted. If you prefer a vegetarian option, you can double up on the beans instead. Then there is the barley – I had a bag of gorgeous purple heritage barley from the farmers market I couldn’t resist adding to the stew. It adds heft and extra nutrients to this already hearty stew. You can omit the grains and add more beans. You get the idea! In this month’s installment of Cooking for your Health, it’s time to get serious: Let’s talk bikinis. Summer is nearly here in the northern hemisphere, and while the weather may not yet be blinding hot, it will be soon enough, which means that it’s time to haul out the swimsuits. Don’t panic. Getting in shape for our bikinis and trunks should not sacrifice good nutrition, flavor or enjoyment. 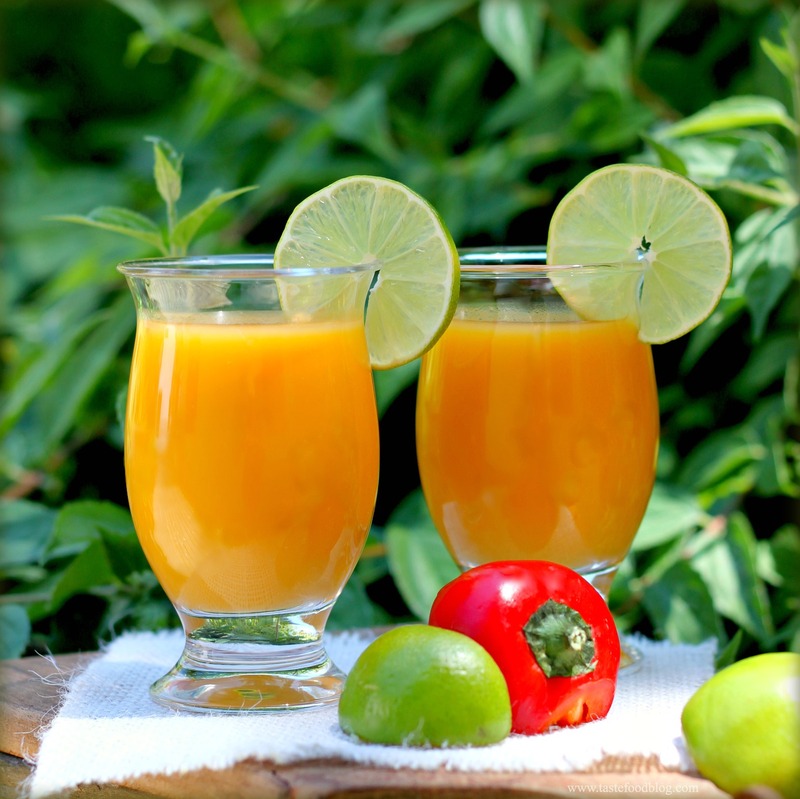 That’s where this smoothie comes in as the perfect liquid meal and refreshment for when the days grow warm. I can’t help myself. I am on a soup and stew bender, and this chili is my latest rendition. This chili is a hearty stew perfect for the winter weather. 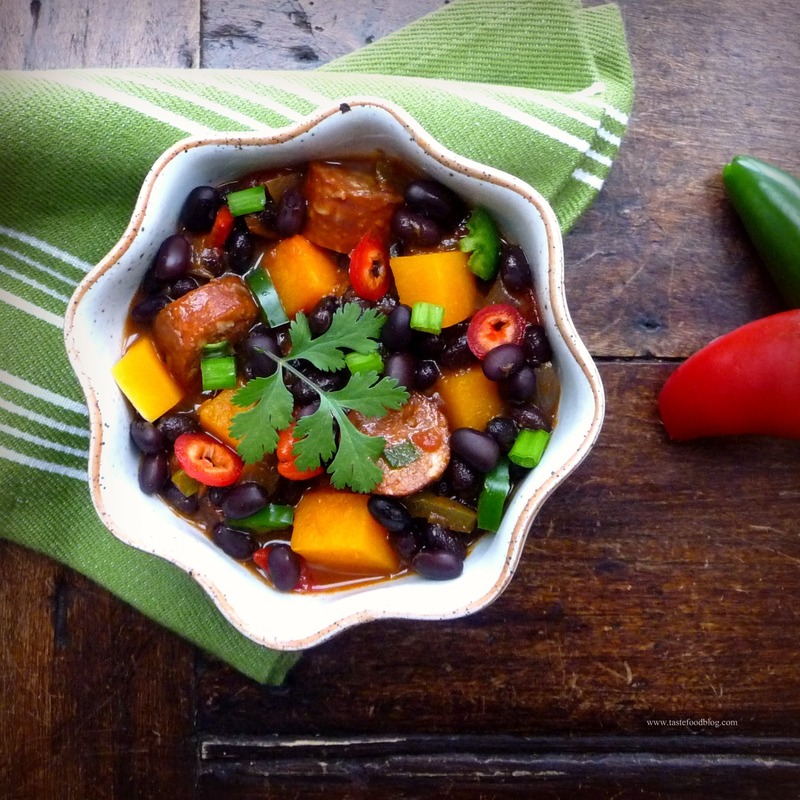 It’s chunky and sating, packed with black beans, brimming with peppers and butternut squash, and fortified with spicy sausage. If you can stand it, let it refrigerate overnight before serving, and it will taste even better. This will warm you in the cold weather, and is a festive snack option for Superbowl viewing. Heat olive oil in a stock pot or deep skillet over medium heat. Add sausages and brown on all sides. Transfer to a plate lined with a paper towel. When cool enough to handle, cut in 1/4 inch slices. Add onion to pot and saute until softened, 3-4 minutes. Add squash, garlic and peppers. Saute 3 minutes. Add dry spices and cook stirring, one minute. Add tomatoes, chicken stock, tomato paste and bay leaves. Simmer until squash is tender, about 20 minutes. Stir in black beans, sausage, salt and pepper. Simmer 10 more minutes. Taste to adjust seasoning. Before serving add cilantro. Serve in bowls with with scallions, fresh avocado (if using) and additional cilantro.